Well I wasn't able to find out much about this on the internet, and by that I mean I couldn't find a review to copy and paste! Oh well. 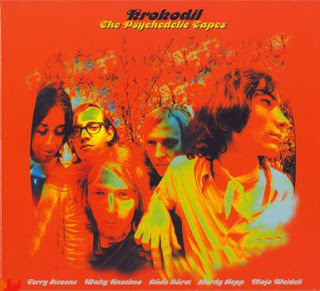 1970-1972 were the psychedelic years of the mighty Krokodil from Switzerland who made the stunning psychedelic kraut rock album "An Invisible World Revealed". During this early period the band recorded a lot of magical songs both live (3 tracks) and in the studio (5 tracks) which are now after more than 30 years released on CD. Long trippy space rock with a West Coast/Kraut Rock edge, featuring fluid acid guitar work, flute and effects. The CD includes a great version of Pharoah Sanders' "The Creator Has a Master Plan", which surprisingly doesn't sound all that jazzy, a live 30 minute version of "Odyssey In Om" from their landmark album "An Invisible World Revealed" - about a third of this is a bass/percussion extravaganza. On the hard rock side is a live version of "Marzipan" from the album "Getting Up For The Morning". The three "Stehaufmädchen" tracks are very interesting, but also real short. "You're Still a Part of Me" is a live version of the song from their 1969 debut album and has a great late 60's bluesy/psych vibe. The last track, "Raga" is some cool sounding Sitar work. Anyway this is a very good CD and if you like "An Invisible World Revealed" this is a totally worthwhile addition to your collection. Next week, then! Comments appreciated. I already got the album. It's great but it doesn't match the quality of the best studio work back then. Still... as I'm a fan of live-recordings those songs have their moments, sometimes even really surprising. Wish I had seen more of them back in the day. I saw two shows of the late band and as I recall (somewhat blurred memory due to certain... you know) the impression of a consistent show was much better. Maybe somewhen a full professionally recorded show of that era pops up and I can verify that... or not. Many Thanks! Now for full happyness I must find "Swamp"
Hi mike - thanks for sharing your memories! That musta been great seing these guys. Hi PapaShura - You're welcome! Been ill for a couple of weeks and was really surprised to find this one still available. Another lossy consigned to the bit bucket. :) Cheers! Nice album!! most people says; it is some version of ´groundhogs´, thats ok!! I love them too.